Now, you can see Gmail’s Contact Manager has started including the information form Google Profiles. At the same time, you can also find your Google+ circles on the sidebar. The data obtained from Google Profiles will be displayed below the information you’ve entered. Though it is a default action, you can combine them by following the following steps. Open the contact page, click the "More" dropdown and select "[Show external data] inline". 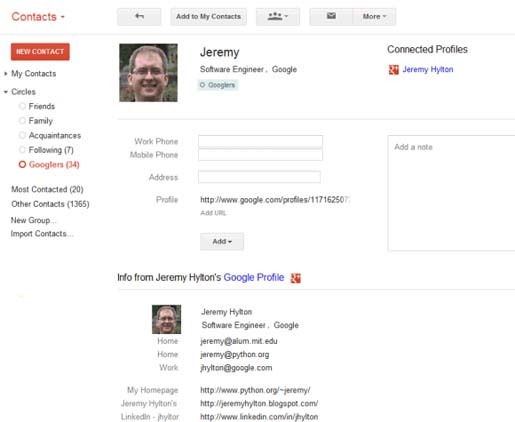 If you enter an email address associated with a profile, the Google Profiles data will be automatically added. If you wish to remove this information, you can delete the corresponding email address. Moreover, you can see the latest feature at google.com/contacts, which has recently switched to the new Google Contacts interface. You can also find them in the older interface of Gmail.